The following is from the February 2019 Acorn. My December was overwhelmed with a single thought and a single life changing encounter. You’ve heard it before, but do you really believe them? ANYTHING IS POSSIBLE WITH GOD. 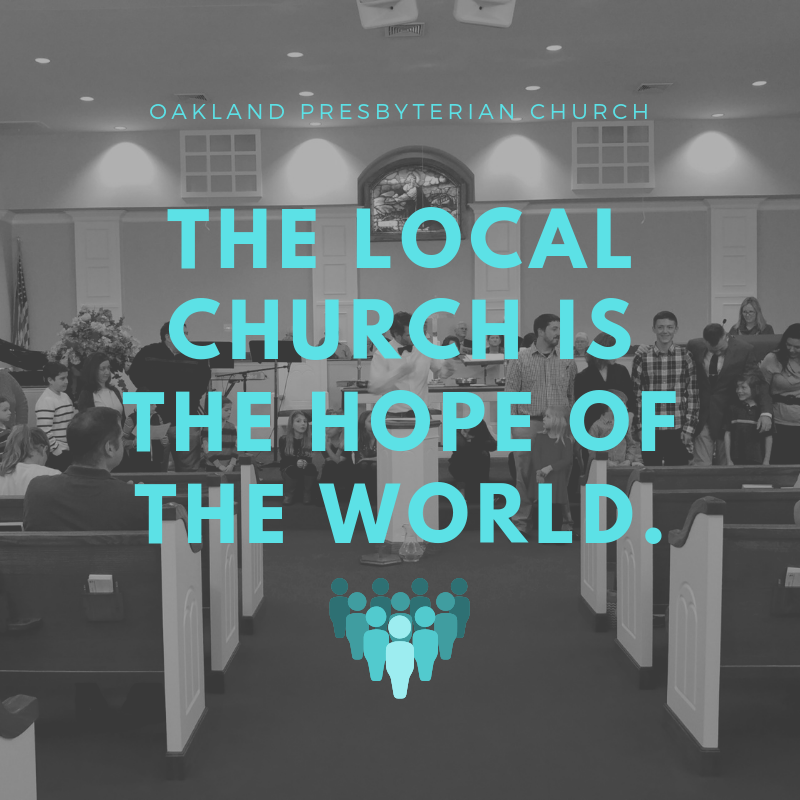 THE LOCAL CHURCH IS THE HOPE OF THE WORLD. The Monday after we canceled church for snow, I ran into Joe David, Joy, and Brittany at Ugly Mug Coffee Shop. Joy and Brittany are both educators, so our conversation turned to difficult children in school. As a special needs teacher, Brittany explained how she’s learned to love difficult children even when they hurt her, push her away, and curse her. She’s seen that if she can love them more than they fight her, love will change them, soften them, and transform them. Love will overcome their fear, anger, and poor coping mechanisms. Love that loves even when I fight back. Love that keeps loving even when it is rejected. Love that keeps coming even if it involves being rejected, despised, and injured. Love that risks rejection for the sake of redemption. THAT SOUNDS LIKE JESUS DOESN’T IT?! 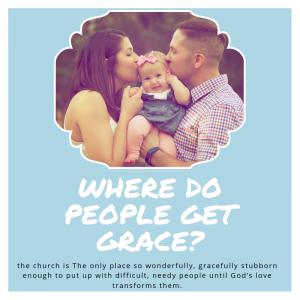 In the church, we call that kind of undeserved, unconditional love, “GRACE, AMAZING GRACE,” and we are given grace upon grace in Jesus who chases us down while we kick, bite, scream, pout, and crucify to get our own way. Brittany has learned to replicate Jesus’ grace even though she’s only been following Jesus in church for a little over a year. It’s so cool, how the Holy Spirit has been teaching her GRACE and using her to give GRACE for years. Grace before I know what Grace is, is called “Prevenient Grace” by theologians. And my heart broke. It broke because you’ve taught me to empathize like Jesus rather than judge like the old me always did. Joe and Joy and Brittany all looked at each other trying to think about where in this world grown people can go to learn honesty, integrity, spirituality, forgiveness, gentleness, love, joy, peace, self-control. Where can they go to be liberated from harmful habits and unhelpful coping mechanisms? Where can their character defects be removed and lives redeemed? There are only 2 places I can think of, and the second grew out of the first. The Second is Alcoholics Anonymous and the 12 Step Groups like it. The first is the Church. A place for difficult people to be loved over and over again. Even when they try to push us away, we keep loving them. Even when they curse us, we bless. Even when they sin, we forgive. 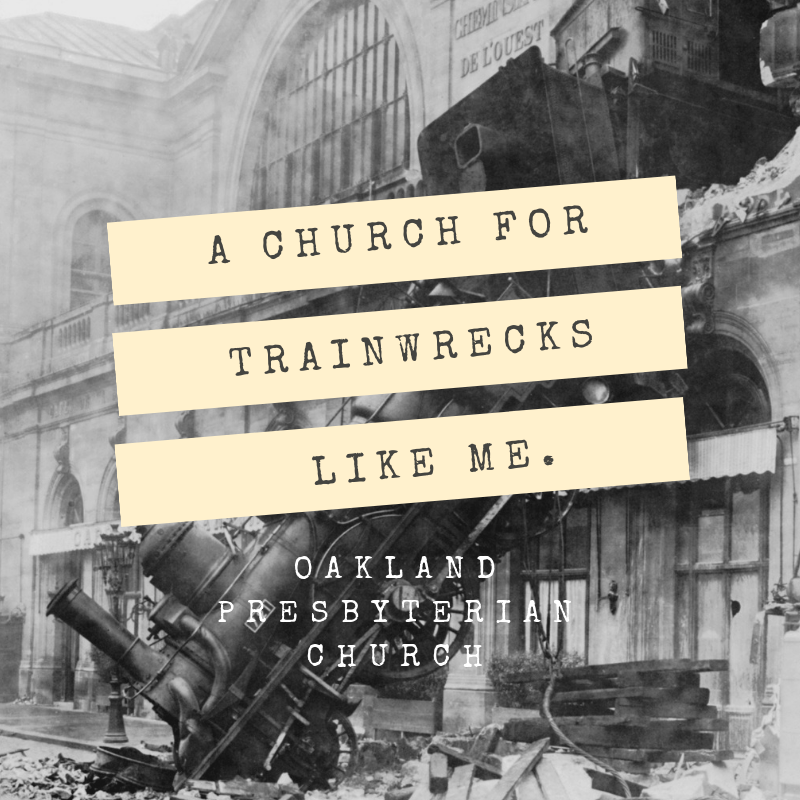 A place where train wrecks are welcome and loved even as they are transformed. A place where the only requirement is a desire to know God and let God change you. A desire not a dress code or decorum or diploma or accomplishment is the only requirement. A mustard seed of faith in God and hope for healing. The Church is the only such place. The Church is the only hope for such families and such people. They didn’t learn it from their parents, they didn’t learn it in the Army, or on the job. They won’t learn grace and be transformed by grace by watching TV or going to counseling, but by following Jesus with other sinners. The church is the only place where the transformative power of grace can reach them FOR FREE. The only place so wonderfully, gracefully stubborn enough to put up with difficult, needy people until God’s love transforms them. It is the only hope for them because it is the only hope for me. It is the only hope for them because it is the only hope for me. I am one of those unlovely people who came into a church with a pile of regret and a suitcase of resentments. I owned suits and spoke refined English, but I was full of deceit, cowardice, people-pleasing, selfishness, and fear not to mention covetousness, lust, and anger. Where am I going to learn to trust Jesus not just with my eternal salvation, but my daily life and my inner character. Where am I going to learn gentleness, forgiveness, honesty, empathy, and grace? Friends, the only hope for my marriage, for my parenting, for my character defects, for my past sins, for my future failures is a real connection with Jesus and Jesus’ people because I cannot figure out how to follow Jesus without you. You are the ones teaching me how to listen to my wife, to settle disagreements civility, to subjugate my wants to others’ needs, and so much more. the only hope for my marriage, for my parenting, for my character defects, for my past sins, for my future failures is a real connection with Jesus and Jesus’ people because I cannot figure out how to follow Jesus without you. Church is where the prideful learn humility, where the vindictive learn forgiveness, where the greedy learn generosity. This is where the person with no friends learns to make friends, the person who has never been loved learns to be loved, the person who’s always right learns to be a sinner, the person who’s never been good enough learns to belong, the person with cancer learns to persevere, the person with an unplanned child learns to parent, where emotionally absent dads learn to be present, where the spoiled learn to serve, where the shy learn to talk to strangers, and where the blabbermouths learn to shut up. The encounter reinvigorated my whole ministry. It reminded me and convinced me practically. 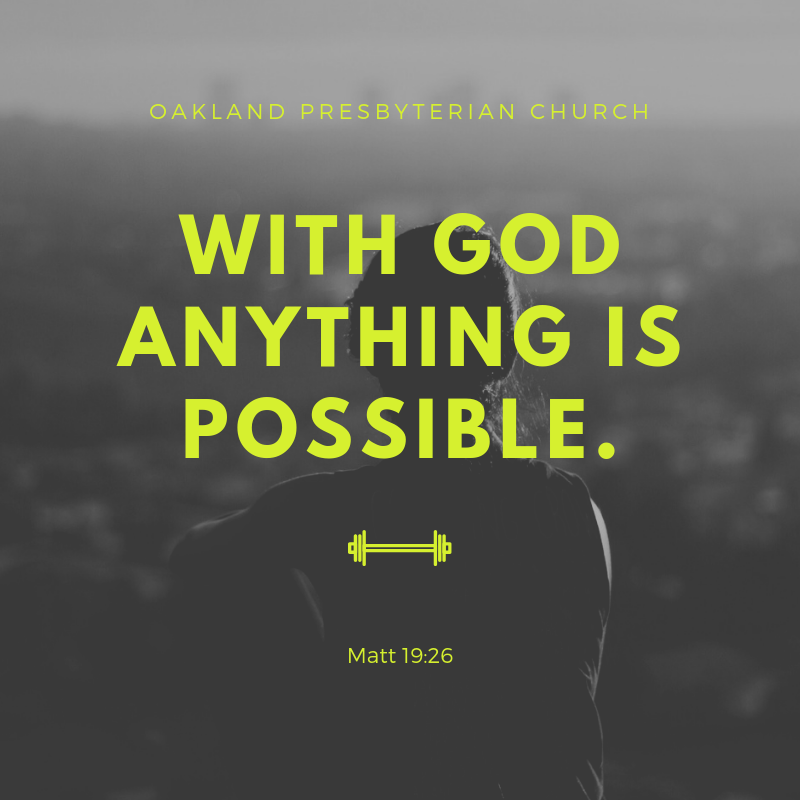 Anything is possible at Oakland, because anything is possible with God. Oakland is the hope of the world. 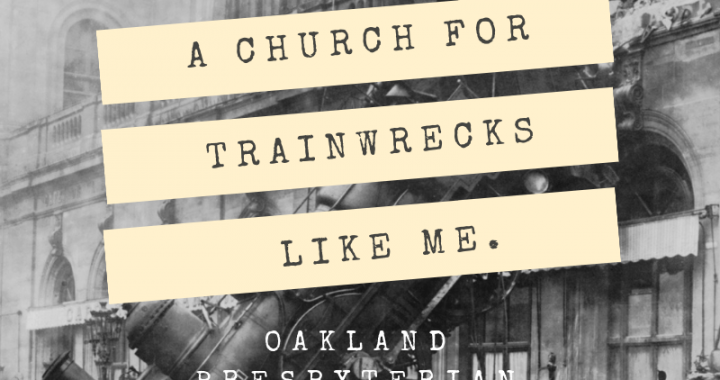 In God’s Church, in Oakland, transformation is always possible. No one is too far gone to repent, too unlovely to be loved, too broken to be mended, too rebellious to be the prodigal, too drunk to get sober, too sick to get healed, too lost to be found, too addicted to be liberated, too deceived to get honest, too cynical to meet Jesus, because OAKLAND is a place to meet Jesus and learn to follow him, because Oakland is a place where the grace of God must be as tangible and visible as the wind in the trees and the sun on our skin. If we always point to Jesus and love one another like Jesus. Jesus. Jesus. ANYTHING IS POSSIBLE. We are the hope of the world. Not government, not PBS, not better education, not better rules. ONLY JESUS AND HIS CHURCH. Only the church. Only the church can teach people not to blame, hide, lie, or practice self-righteousness, but to surrender their wills and lives to the care of God, who has proved his love by sending Jesus to save us. Posted in Pastor Andrew's Blog, Uncategorized and tagged AA, Anything is possible, Grace, Hope, Hope of the World, Local church.